SALT LAKE CITY, UT. — Super Bowl champion cornerback, Richard Sherman, was the keynote speaker at the 2014 Adobe Digital Marketing Summit held in Salt Lake City, Utah. The Seattle Seahawks star cornerback spoke to a crowd of about 7,000 digital marketing executives about reinvention and how a kid from Compton, surrounded by bad circumstances who made good grades, worked hard to create a new life for himself. Photo shows Seattle Seahawks star cornerback, Richard Sherman, speaking at the 2014 Adobe Digital Marketing Summit to a room full of football fans and marketers. In regards to individual branding Sherman said, “You want to provoke a response and a discussion. You want to be unique in your field. Honesty and being genuine is what sells in my field.” He mentioned Deion Sanders as an influence on the type of pro athlete he wanted to be, and create a personal brand around. Few people know that Sherman is a Stanford graduate with a degree in marketing communications. At the conference, Sherman discussed his influence as an athlete and how important branding yourself is as well as the impact of social media. He also spoke about his over 900k followers on Twitter and how he considers himself apart of #nerdnation. In a twenty minute conversation between Sherman and sports reporter Colin Resch, he spoke to a room full of football fans and marketers about his rant with Erin Andrews and more. 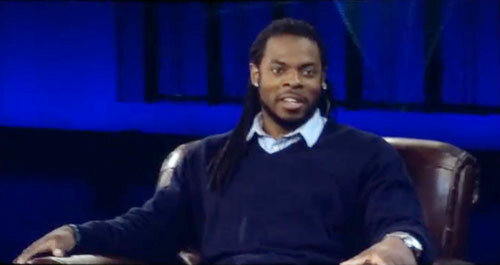 Watch Richard Sherman at the Adobe Summit 2014 in Salt Lake City, speaking about comments he made to reporter Erin Andrews after the NFC Seattle Seahawks-San Francisco 49ers game . Sports Speakers 360 is a booking agent for motivational sports speakers. If you would like to book athletes like Richard Sherman for an event, contact Richard Sherman’s booking agent for appearance & speaker fees. For information on how to hire Seattle Seahawks players for appearances, call 1.855.303.5450.